VALLEJO, Calif. /California Newswire/ — A different kind of Christmas! The City of Vallejo, California celebrates the Mad Hatter Holiday Festival throughout the city combining a parade, tree lighting, festival, boat parade, museum exhibit, grand homes tour, city hall exhibit and free bus service to and from the festival throughout the city! – Wonderland Festival Activities begins at 2 p.m. in Unity Plaza, downtown Vallejo. – Tree Lighting Ceremony at 6 p.m.
– Lighted Boat Parade at 6:30 p.m.
– Mad Hatter Costume Ball at 7:30 p.m. The Mad Hatter Costume Ball will be at Dance Unlimited, 501 Georgia Street – two dance floors, three bands, DJs, dance performances, costume contest, food and drink – be entertained by The Shams, Bay Area's popular hard rocking, fiddle playing, punk-infused group along with Fiddlaround, an acoustic trio performing fiddle tunes and swamp boogie and Raymond Victor: The Used Blues Band with foot stomping bluegrass music. "Gazing Through the Looking Glass" exhibit at the Vallejo Naval & Historical Museum explores how some artists have picked up Lewis's characters and made them part of contemporary art: the exhibit features work by celebrated illustrator Barry Moser, visionary artist Charles Ware, and fantasy artist Ronnie Goodman. Lectures, film, and presentations will accompany the exhibit. Vallejo's Grand Homes Tour from charming historic homes ranging from imaginative craftsmanship to Victorian Italianate with a special treat to visit one of Burning Man's top creations the NeverwasHaul built in 2006 – a magical nomadic 19th century Victorian three level structure inspired by the works of Jules Verne-decked out for the holidays. 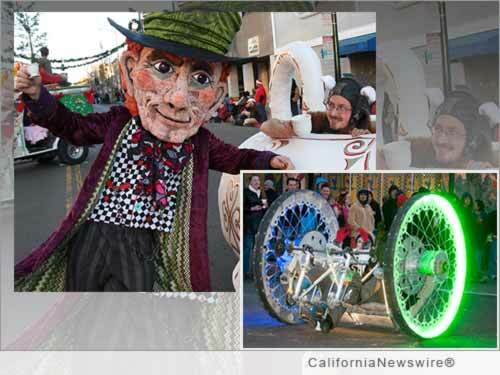 Art mobiles, fire-shooting snails, dragons, and horses light-up Vallejo's streets – marching and dancing Maritime Academy Cadets grace the downtown, other attendees donned with top hats and Victorian attire come in droves to celebrate Wonderland once again. There is a 5 foot Santa G-Nome that shoots fire from the top of his head thirty feet into the air, giant multicolored Wagon Wheel: The Vicious Cycle, the Mad Hatter, mouse, Lion King, Cheshire Cat, as well as roving Queens and Duchesses, along with the white rabbit – giant mushrooms and cupcakes come alive, an adult and children fantasy Wonderland that continues on weekends throughout the month of December. FACEBOOK – MAD HATTER HOLIDAY VALLEJO: https://www.facebook.com/MadHatterHolidayVallejo .